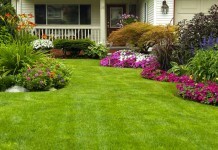 Lawn care in winter is required for a lush green lawn in the spring. Learn how to care for it in this informative article. Lawn preparation for winter is one of the most important gardening tasks that must be done in time and correctly. 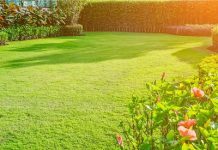 Adequate fertilization, mowing and removing weeds and debris provide the healthy lawn appearance, but there are a few other things you should do, which are given below. Scarification is done to remove thatch or undergrowth from the lawn. This removes way moss, weeds, and dead organic debris which impede the flow of water, air, and nutrients to the roots. You can scarify your lawn in late spring when all the dangers of frost are passed or in the fall. Before scarifying your lawn, mow it. Scarify only to remove the top layer of thatch, don’t penetrate the blades too deeply. Aeration improves the airflow in the soil and reduces its compactness so that water, fertilizer, and oxygen are easily absorbed by the roots. This treatment improves the condition of the roots and helps in quick regeneration of grass after the winter. Aeration should be done in fall in late September or October. However, according to a research conducted by Purdue University, aeration is done too late even until the November might be helpful. Generally, grasses grow well in neutral pH and if your soil is acidic, do liming. Best time to lime your lawn is fall, after the aeration. The cycle of freezing and thawing in winter assists the penetration of lime into the soil. After the aeration, if you see holes and patches apply the seeds at a rate of 0.8 Oz (25 g)/m2. Colder months are the perfect time for seeding scraggly patches of lawn. It is done when the soil is not frozen but cold enough to stop germination until next spring. To learn more about how to do it, read this. Top dressing is the process of application of a thin layer of soil, sand or compost over the turf. Top dressing is done after the aeration and overseeding. It helps in leveling the surface of the lawn, protect it from extreme temperatures, controls thatch, improves drainage and resistance to drought. Plus, there are many more other advantages. However, it is skipped in home gardens and lawns. To learn more about top dressing, check out this educative article. 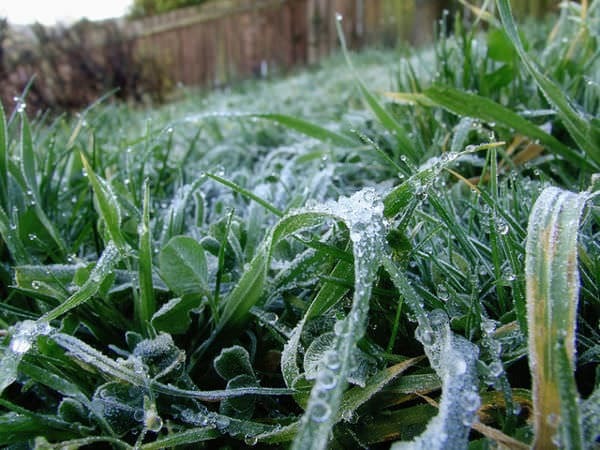 By proper fertilizing the lawn before winter you can increase the turf resistance to freezing temperatures. The application should be done 2-3 weeks before first frost date using so-called “winterizer fertilizer” such as 24-2-14 NPK. But beware that winterizer should not be applied to warm-season grasses as it will encourage them to grow. The high level of potassium in winterizer makes grasses more tolerant to cold and stress, helping them to survive in winter. Grass must not be cut too short or too high. Optimum height for last mowing job is leaving 2/3 of grass blades. The last mowing is best done anytime in between late October to mid-November, depending more on the prevailing weather conditions. If you mow the lawn too early before winter and warm weather has made the grass to grow again, mowing must be repeated. During winters, mowing is not required. Once temperature falls below 40 F (4 C) grass starts to grow slowly. To find a perfect lawn in the spring, continue weeding, even in winter. Thus, the uncontrolled growth of weeds does not choke your lawn. But rest assured, it is paradoxically easier in winter. At this time, weeds grow faster than grass. This makes them much easier to spot on – except of course when snow covers the garden. Watering the lawn in winter is almost never necessary. Nature takes care itself with the frequent rains of this period. However, if there is no rain and the grass suffers, then you can water the lawn. Choose a frost free day when the temperature is above 40 F (4 C), water half an inch in the morning. Another important step is to regularly clean the fallen leaves and debris. Fallen leaves if remain on the turf reduces its durability. 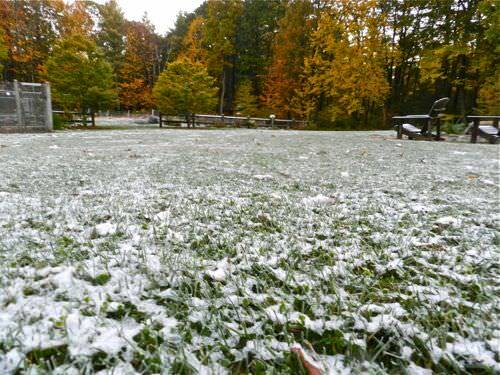 Damp leaves “pressed” under a layer of snow cut off the supply of oxygen and cause rotting of the lawn. You can use this organic litter to make compost or to mulch other plants. Before the onset of winter, it is good to also think about the discouragement of moles. Many people believe that they hibernate in winter, which is false. They remain active underground, making tunnels under the surface of the lawn and damaging grassroots. It is, therefore, appropriate to do mole control, to learn how to get rid of them read this. Pay attention to the appearance and proliferation of moss is formed mainly in the most exposed in the shade when the sun is low. Finally, since, at low temperatures, the grass becomes more delicate, if possible, do not walk on the lawn, especially if covered with ice or snow. 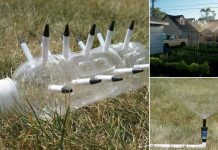 This will avoid breaking the blades of grass and make them rot.